‘WHEN WOMEN VOTE It won’t be lawful for a man to remain single’. All the men are being rushed into marriage – tweaked by the nose and carried under the arms of women – and all because they have a vote! The card was published by Mitchell & Watkins, who had been producing postcards – both topographical photographic and artist-drawn – from c 1906. This card was posted – in, I think, 1913 (the postmark is obscured) – to Miss Ida Currell – who had been born in 1882 and was one of 4 surviving children of the 10 born to a Hertfordshire farmer and his wife. The Currells farm, at 2 Ware Road, Hertford, was called ‘The Chaplains’. The card is in very good condition and is £45 post free. 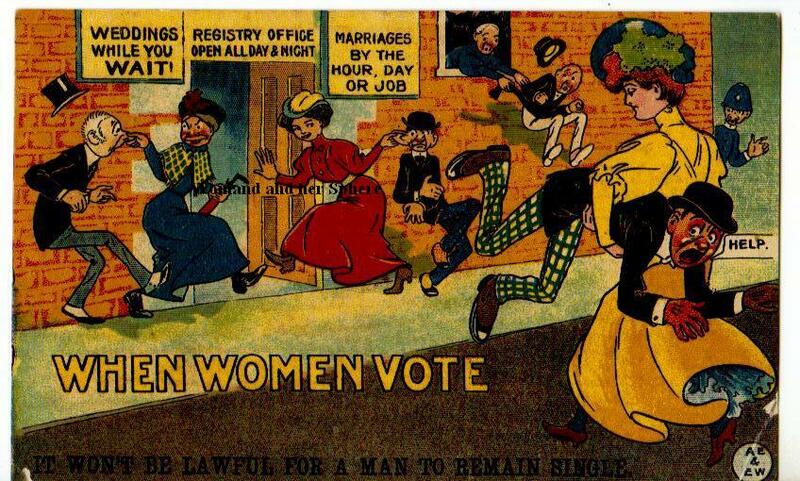 This entry was posted on July 31, 2012, 11:21 am and is filed under Collecting Suffrage. You can follow any responses to this entry through RSS 2.0. You can leave a response, or trackback from your own site. Suffrage Stories: Is This Edith Craig’s Banner For The Catholic Women’s Suffrage Society? BBC Radio 4 Woman's Hour: Who Won the Vote for Women – the Suffragists or the Suffragettes? Enterprising Women: the Garretts and their circle. OUP Blog: Why Is Emily Wilding Davison Remembered As The First Suffragette Martyr?